I ran to the corner store this morning for an energy drink, I returned with five bags of Rap Snacks brand potato chips. That’s snackologist life. 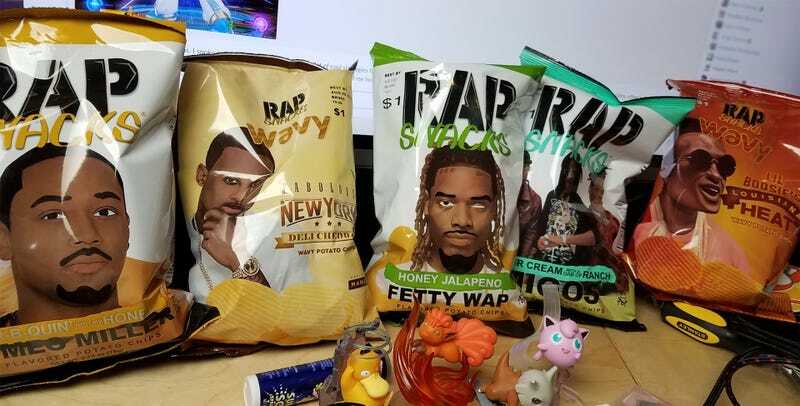 One minute you’re thirsty, the next you’re eating chips out of a bag with Fetty Wap’s face on it. Distributed by the fine folks at RapSnacks of Locust Grove, Georgia, these inexpensive face-covered chip bags have been showing up all over the Atlanta area as of late. You can’t beat a bag of chips for a dollar. That and a can of Arizona ice tea and you’ve got lunch for two bucks and change. Unless you opt for the Romeo Miller Bar-B-Quin’ With My Honey flavor, which is $1.29 for some reason. Rap Snacks are a neat concept. Flavors styled after rap artists’ tastes, QR codes on the back that could score the snacker a download of an unreleased song. But I am a snackologist, so it’s not about the concept. It’s about the taste. We’ll do this real quick. Honey Jalapeno Fetty Wap: Sweetness hides the jalapeno flavor, but the lingering burn lets you know the peppers are there. Fetty Wap’s eye prosthesis (he was born with glaucoma in both eyes and lost the left) only enhances the flavor. Sour Cream with a Dab of Ranch Migos: Starts off tasting like any old sour cream chip, then gets really sweet. Like too sweet. Reminds me of a Japanese chip flavor. Are Rap Snacks responsible for the Japanese potato chip shortage of 2017? Lil Boosie’s Louisiana Heat: My wife’s favorite, definitely taste more like Lil’ Boosie than his current moniker, Boosie Badazz. Nice hit of cajun spice with a smokey hot sauce afterburn. Fabolous New York Deli Cheddar: These are really nice. Cheddar with a bit of a kick to it, which I wasn’t expecting. Sharp, surprisingly complex. Best of the bunch? Yeah. Bar-B-Quin’ With My Honey Romeo Miller: Most barbecue chips are some combination of sweet and smokey. These are just sweet. Eating these was like eating an extra $.29 of sugar in every bite. Rap Snacks call themselves the official snacks of hip-hop, and while I am a board licensed snackologist, I am no expert on hip-hop. My rhymes are slow and ponderous, my flow preposterous like a rainbow rhinoceros come to process us. If you want to give Rap Snacks a try for yourself, find some and buy them. Start checking with the place down the street from my house. You know the one.